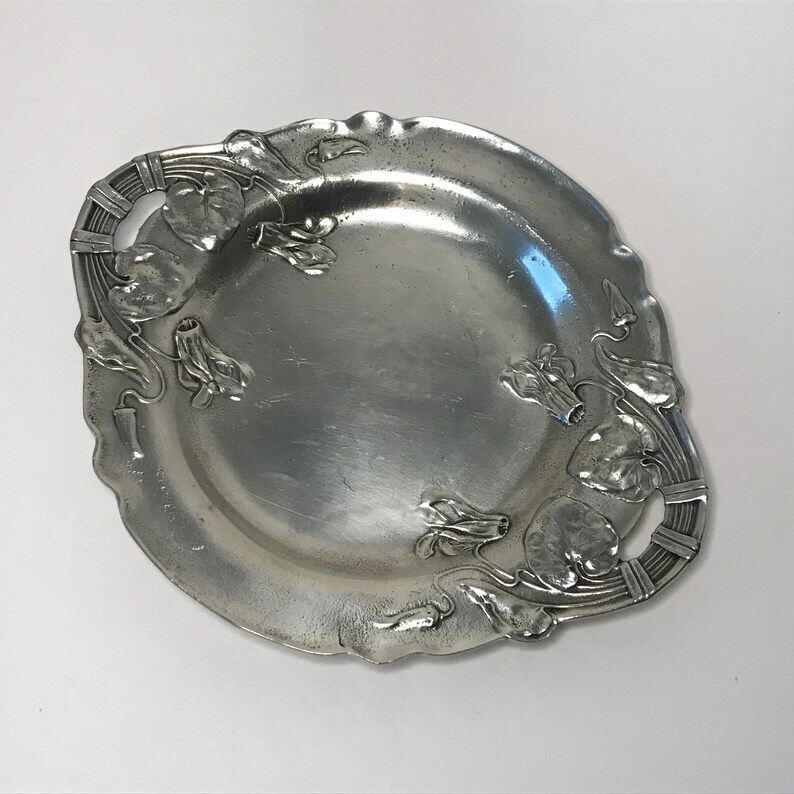 This sweet, Art Nouveau-style tray is perfect for candies, jewelry, business cards or whatever small trinkets you have in mind! Made of cast pewter, the petite, handled-dish is beautifully decorated with detailed Morning Glory flowers, spiral buds, leaves and vines. As the Morning Glory blooms and dies within a single day, this particular flower symbolizes love and affection as well as mortality. I am offering as found and have not attempted to clean or polish. That being said, the scalloped-edged piece is in excellent vintage condition with no bends, breaks or repairs and very minimal surface scratching. Even though the tray sits on four dot feet, there is a significant wobble. Measurements are: 6 7/16" in diameter (7 7/8" wide at handles) by 5/8" high. Symbol of crossed hatchets and stars along with another symbol that resembles crossed "U"s. These graphics are encircled in a chain made up of closed circles. Stand shown in photos is for display purposes and is not included.